Maybe somebody warned me but I don't really remember. When my first teeny tiny newborn arrived I would stare at his tiny little feet and wrinkled little fingers and think about how he was probably the most perfect being ever. I would watch his mouth open for a little yawn and think it was the sweetest thing I had ever seen, I could never imagine that in just a few short short years that same mouth would scream "I DON'T LIKE YOU MAMA" because I didn't give him fruit snacks for breakfast. NEVER coulda imagined. Age three is an adventure. It's like a hike......One minute you are hiking all peacefully. You are walking along flat trails and the sun is shining but there is a perfect amount of breeze that is keeping you just the right temperature and bunnies jump by you and you admire the beauty of nature. And then the next minute you are hiking up trail and the sun is scorching down on you causing a horrible sunburn and it's shining so brightly that you can't see ahead of you and then a bear comes out of nowhere charging at you and you just want to lay down and cry. Clearly we have good times and bad times. Good days and bad days. Peaceful hikes with bunnies and times where it feels like a bear is charging at you. And really, the age three trouble came overnight. It was like "happy birthday Eli" and then BOOM he started developing several age three personalities. Some downright scary. We have tried various discipline tactics and while some work we needed something really effective with Eli. Plus we wanted something that didn't only bring attention to Eli's bad choices, but also rewarded him for making good choices (i.e. not hitting me). 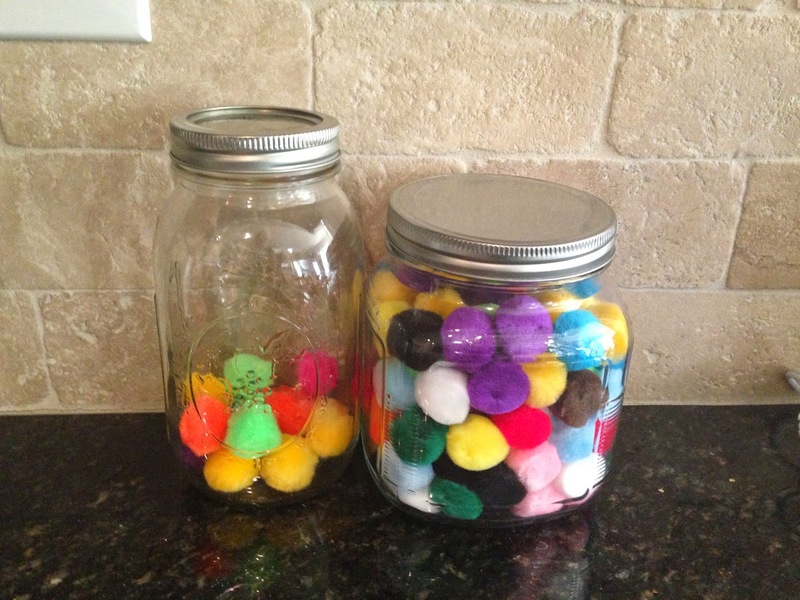 I did some searching around Pinterest and put a couple of ideas together and came up with our colored balls systems. I bought the little poms from Hobby Lobby and started calling them colored balls but Luke said I definitely needed to change the name. So then I called them little balls of goodness (because they were rewards for doing something good) but Luke said Eli would be the weird kid if he went to school and said he got balls of goodness at home so then we just started calling them colors. Seems boring to me but it works. This is how it works: We have two jars of "colors", one that holds all the colors and the other one where the colors go, basically his "bank" of colors. We let Eli go to the store and pick out a toy - or in this case a sports related accessory (are sports things considered accessories?) He wanted some bases so we got a set of bases. I then took a pic of the bases and printed it and taped it to his jar (seriously could I get any more craftier?). Then we put the bases up and told him he could get them when he filled his jar with colors (or balls of goodness). Then anytime Eli was good he added colors to his bases jar. When he was bad he took colors out. At the beginning of our adventure with the colors we could tell we were going to have to make an adjustment because we were losing steam fast. We needed him to actually get the reward to see how the process worked. So whenever Eli was caught doing something good, or doing something the first time he was asked he got like 10 colors. Slowly but surely the colors made it to the top of the jar. Eli got his bases and saw that it paid off to make good choices in life. So we continued to use the system. Most of the time when he is being disobdiedent we just have to ask him "Do you want to lose some colors?" and he will shape up. Most of the time. Obviously it isn't fail-proof. He still has bad moments and there are times we even forget to do the colors so if you see my child in public acting crazy please do not think I'm 'a liar. I'm just the mom of a three year old. But for the most part this has worked really well in our house. Eli is really a good kid, he just has his typical three year old moments and we are learning how to handle them as best as we can. All while praying that maybe age four brings a little less fits. That's awesome! I'll be pining this for later use. I'm so glad you're blogging again i love your writing style. Three was the hard age for my children too...and now for my grands. One thing I think helps is putting the *bases* where he can see them as a reminder of how wonderful it will be to get them. Maybe on top of the refrigerator!! You are doing a great job!! I've done this before in classes that I've taught. Works so well! I've never thought about doing this for individual kids, but I love it! Storing this in the back of my mind for when we hit 3! 2-3 is the toughest age. But, by 3.5 it is like a whole new ballgame. 3.5-5 is the sweet spot and by far my favorite age!! !